I knew it would have a non EU power plug but an EU adapter converter is included. 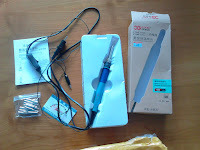 Two weeks after ordering i received my new soldering iron. (For orders from Aliexpress this is real fast!). All was according to the description. Using the EU power adapter converter works fine in a standard power socket. However it does not fit in the grounded socket that i used for my previous soldering iron. The soldering iron has a ground wire with a alligator clip (same length as the power cable). To put it a bit out of the way i used some tie wraps to put it together with the power cable to just after the power switch in the power cable. There is a little manual included (see PDF/scan) that i can not read as it is in Chinese. The soldering iron heats up very fast. With the two buttons on the iron you can adjust the (set)temperature. A dot (and the display of the actual temperature) indicates if the temperature has not yet reached the setpoint. I am very happy with this new soldering iron. - the Chinese instruction manual (not needed yet to use this nice soldering iron. ).